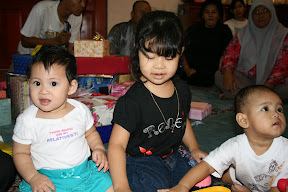 On the 13th and 14th of February I went to Seremban to attend Mommy's cousin, Mak Lang Nur's wedding to Uncle Wan Zul. Both Mommy and Dadda took leave on Friday the 13th so that we wouldn't have to rush to Seremban after work. This was taken a week before the wedding during the preparation! I'm 'helping' out putting papers in the souvenir box! After Friday prayer we took off to Seremban in 1 car and Tom Mama and PakSu Ami in another. Tok Abah couldn't go because he had his lecture. When we arrived in Seremban, everybody was busy preparing the house, room, living room and souvenirs. We headed to Atuk Ngah Man's house just next door to Atuk Long's house in Bukit Chedang to get ready. Tok Mama, PakSu Ami, Wan Teh and Wan Ki got ready there too. With Mak Lang Nur before her akad nikah. Look at me all happy in white! At around 9pm the ceremony started. It was the 'Bernikah' ceremony where they sort of get themselves 'registered'. The 'Tok Kadi' was quite funny, according to Mommy and Dadda. I just laughed whenever anyone or everyone laughed. Yes, I was quite noisy that night, hehe... was just trying to liven things up! Owh, I forgot to mention that Kak Alyssa was also there but she wasn't feeling very well. She was asleep by the time the ceremony took place. Me, Dadda & Mommy with Mak Lang looking splendid in her akad nikah dress! Listening to the Tok Kadi performing the akad.. Nice B&W pict by Dadda! With Auntie Aishah (Uncle Imal's gf :).. Takleh dok diam! After that, all guests proceeded outside for dinner. By then I was already quite tired and sleepy so I took a short nap after showing a teeny weeny bit of tantrum. When I woke up, most guests have already left. Mommy fed me with some fruits while we took photos with Mak Lang Nur and Uncle Wan Zul. We retired at Atuk Ngah's house not long after that, at around midnight. All of us with the happy couple, Mak Lang Nureliza & Pak Lang Wan Zul.. The next morning I woke up later than others, around 10am. Mommy bathed me and Dadda took me next door to Atuk Long's house for breakfast while Mommy had her shower. 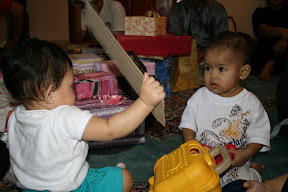 We then sat and watch TV while I played with Pak Ngah Iwan. After Zohor prayers, Dadda, Mommy and I went to the hotel in Seremban town to check-in. The wedding reception was to be held there, in the ballroom of Royale Bintang Hotel. Yeaaaayyy, I'm happy to be on my big bed in the hotel! The room was quite nice. We got a room with a connecting door to Tok Mama and Tok Abah's room next to us. Tok Mama, Tok Abah and PakSu Ami arrived later in the afternoon because Tok Mama and PakSu went back to Subang after the nikah the night before. Originally, they were supposed to come back in the morning but apparently, one of Tok Mama's close friends passed away that morning so Tok Mama went for the funeral before coming back to Seremban. While waiting for them to arrive, Mommy and Dadda had their lunch while I crawled around the two bedrooms, exploring! It had quite a nice view of the rest of the hotel so most of the time I spent sitting near the glass window, looking out into the garden of the hotel. After awhile Aunty Huda and Mak Lel arrived and after everyone excluding me had performed their Asar prayer, Mommy, Aunty Huda, Mak Lel and I went down to check the ballroom out. Then, we went outside to the pool area where there were people swimming. Near the pool, next to the spa, there was a playground. I went on the see-saw and slide. Too bad there weren't any swings for I would've loved to go on it. Playing on the sea-saw with my 2 Godmothers, Mak Lel & Auntie Ude! I know I'm supposed to go down the slide, but for it's more challenging climbing up the slide! Mommy didn't bring my swimsuit so I didn't get to swim in the pool but I did get to sit by the pool playing with the water with my feet, though. Dadda came down to join us later on for a wee while before going back up to the room to get ready. By the time we got back to the room, Tok Abah, Tok Mama and PakSu Ami have arrived. Mommy, where's my bathing suit.. I wanna swim! After Maghrib prayer, when all of us were ready, Mommy took me down in my stroller. By then, Papa, Mama and Ayah Ngah have also arrived and they came up to our room for Maghrib prayers too. Downstairs, guests have filled the ballroom before the VIPs including Yang Dipertua Negeri Sembilan and all the 'Undangs' arrived. Kenyang perut, tidur lagi.. Slept through the whole merenjis ceremony! When I woke up, the event was almost over. Guests were already queueing up to say their well wishes to the bride and groom and their parents. We stayed back for a photo session with the huge family. I met a lot of friends and relatives during the farewells and photo shoots. They all thought I looked gorgeous in my silver 'baju kurung'. I'm sure Mommy and Dadda were very proud of me. Finally after the photo session that took about an hour to wrap up, we went up to the room around midnight and got ready for bed. Awake now.. In front of the elegant pelamin! 3 single girls & 1 Mommy! With Dadda, Uncle Ijai & cousin Alyssa! With Tok Abah & Tok Mama..
With Nek Wan & Nek Tok, also Tok Long, Wan Jah, Wan Teh & Tok Teh! Group photo of Atok Kassim & Wan Ramlah family with the happy couple! The next morning I had to be forced to wake up for breakfast by Mommy and Dadda. When we went down for breakfast, everyone was already finishing up with their food. I was only half awake. I think Mommy and Dadda were also tired because instead of hanging out around the pool like everyone else after breakfast, they took me up to the room where I managed to get more sleep while they pack. At noon, we checked out and went back home. All in all, it was an interesting weekend for me. We're still waiting for Mak Lang to show us photos from the professional photographer from those nights. I'll be attending more weddings this year. I'll keep you updated. SELAMAT PENGANTIN BARU TO MAK LANG NUR & PAK LANG WAN ZUL! Some of the wedding pictures featuring me can be accessed here!